Robbie Laing trained colt Direct Charge was able to turn the tables on his opposition in today’s Group 3 VRC Maribyrnong Plate over the flying 1000m at Flemington, defeating those that finished ahead of him in the rich Inglis Banner last start. Direct Charge ($105,000 2012 Classic, 2c Charge Forward-Lady Of Choice) was given a confident ride by Steven Arnold down the Flemington straight, fighting off joint leader Shamus Award at the 300m mark before holding out the late challenge of Crack A Roadie, giving Arrowfield stallion Charge Forward the quinella. 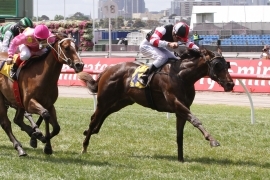 Shamus Award held on for third ahead of Diva Dee. Saturday’s leading quartet were also the first four over the line in the $250,000 Restricted Listed MVRC Inglis Banner (1000m) at Moonee Valley on Cox Plate Day, where Crack A Roadie defeated Diva Dee and Shamus Award, with Direct Charge an unlucky fourth on that occasion. “I thought he could win today, the form experts generally see a horse three deep sharing the lead and he only got beat by two lengths running fourth so it was an enormous run at Moonee Valley,” trainer Robbie Laing said today. “He is a big, rangy fellow (at) 16.1 (hands), not a lot of body about him yet but he’s got a massive stride, the idea was to let him roll along up near the lead and at any stage if he was travelling well enough to go forward because he doesn’t have an electric finish at the moment. He is a promising horse. Direct Charge was a $105,000 purchase by Laing from the draft of Huntworth Stud at the 2012 Inglis Sydney Classic Yearling Sale. “I bought him from the January Classic Sale in Sydney and that’s been out target the whole time we bought him because he was the second top priced colt," said Laing. The $250,000 Inglis Classic race on 19 January 2013 is restricted to two-year-olds purchased from the 2012 Inglis Sydney Classic Yearling Sale and nominated into the Inglis Race Series, such as Direct Charge. The 2013 edition of the Inglis Sydney Classic Yearling Sale will be split over two books. The Summer Book on January 20 & 21 and the Winter Book on June 23.